Accommodation– Hostels start at 130,000 VND per night. Private rooms average about 390,000 VND for a double room. Food – By eating at street stalls and markets you can get a bowl of pho or a rice dish for 22,000 VND. Sit down restaurants are also inexpensive at around 45,000 – 87,000 VND. Transportation – Bus travel is very cheap in Vietnam. As an example, the public bus around Ho Chi Min City will cost a maximum of 3,500 VND. The train is also another inexpensive way to travel with the 791km long train journey from Danang to Hanoi costing 758,000 VND. Activities – Many of Vietnam’s attractions are based around its natural beauty and as such, cost very little. For organized excursions such as touring the Cu Chi tunnels you can expect to pay between 108,000 – 218,000 VND. Halong Bay tours from Hanoi start at 648,000 VND for two-day trips and increase exponentially from there. Street food – The food is usually excellent, really cheap and you can watch it being cooked in front of you. Stick to the local food and you’ll save money. The street-side Pho, bread, and bananas are your best deals. Late-night travel – If traveling long journeys, try to take the late night bus or train as this will save you the cost of a night’s accommodation. Take the tourist bus – It is actually cheaper to take the tourist bus around the country than taking local transportation because of the “tourist” price you get at the bus station. Bargain hard – Tourists tend to be charged more than locals for everything from cyclos to street food. Bargain harder than you would ordinarily, and don’t underestimate the value of walking away. Admire the pagodas – Vietnam’s most distinctive architecture can be been in the pagodas which are found all over the country. They are notable for their beautiful and intricate carvings. Pagodas are used as shrines and temples and are treasured by the Vietnamese people. Wander Hanoi – Vietnam’s capital, Hanoi combines French colonialism with Eastern influences. Enjoy an afternoon exploring the narrow streets of the Old Quarter or visit the countless temples and galleries dotted around this bustling city. Don’t miss the History Museum which showcases artifacts from Vietnam’s colorful history and the Ho Chi Minh Mausoleum. Relax in Dalat – Dalat is nestled in the hills of the Central Highlands and is popular with tourists who want to relax in the mountain air. People flock here to enjoy its serene atmosphere and natural beauty. The hills around Dalat are filled with traditional tribal villages which you can tour but there is plenty to do within the city itself too. Visit the imaginatively titled Palace 1, Palace 2 and Palace 3. Tour the Mekong Delta – The delta is a 60,000km long web of interconnected waterways which spans across three Vietnamese provinces. The area is filled with small craft villages, Khmer Pagodas, mangroves, orchards and the trademark floating markets. The best way to experience delta life is to go on one of the many boat or bike tours. Spend a few days exploring the region. Crawl through the Cu Chi Tunnels – Crawl through the extensive network of nearly 500 km of tunnels utilized by the Viet Cong in the war with the USA in the 1960s. Tours involve a description of the tunnels, after which tourists are allowed to crawl about the maze and fire AK47s at shooting targets. Visit Cuc Phuong National Park – 120 km southwest of Hanoi lies Vietnam’s first National Park, Cuc Phuong. Covering 61,000, this place is home to over 2000 species of trees and some truly rare wildlife including the Clouded leopard, Delacour’s Langur and Owston’s Civet. It was my favorite park in all of Vietnam and the only place I could avoid hordes of tourists. Hang out in Hoi An – Hoi An is one of the most popular destinations for tourists traveling to the country. The place is packed with historical homes and buildings and quaint cafes. It’s small and great for walking, buying suits (they have a huge fashion and tailor market), eating, and relaxing by the river. It was easily my favorite place in Vietnam. Explore Ho Chi Minh City – Also known as Saigon, Ho Chi Minh is Vietnam’s largest city and is definitely worth exploring. Like most cities in Vietnam, you’ll be met with the roar of motorbikes speeding through colonial streets. Ben Thanh market is a must-see for amazing food and there is a great buzz of activity within the place. Hike in Halong Bay – More than 3000 islands sit within the emerald green waters of Halong Bay, one of the country’s most popular tourist destinations. Cat Ba island has great for hiking and many tourists find themselves taking one of the cave tours. Tours here usually leave from Hanoi and last 3 or 5 days. Try to find a good operator as many oversell or lie about what their boats look like. Get Active in Mui Ne – Despite being a fishing village, Mui Ne has got a significant tourism scene, due to its popularity as a wind and kitesurfing destination, and because of the pretty sand dunes that lie nearby. See My Son – My Son is a set of Hindu ruins in Vietnam which date back to the Cham Empire. The Champas ruled over Central Vietnam from the 3rd to the 19th century. The temples here are of incredible historical importance, but they have been largely reclaimed by the surrounding jungle, and have fallen into a great state of disrepair. Don’t come here expecting something as marvelously preserved as Borobudur or Angkor Wat. Visit the caves in Phong Nha-Ke Bang – Hang Son Doong is reputed to be the world’s largest cave, and is located in Phong Nha-Ke Bang National Park. It was discovered by a local in 1990, and “rediscovered” by a British caving team in 2009. You can arrange trips to see this stunning cave. Be prepared to be blown away by its beauty. 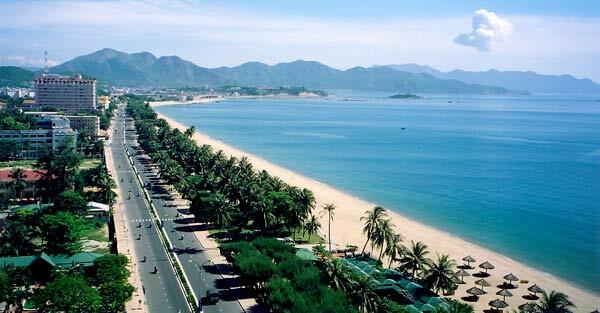 Dive in Nha Trang – This area is full of seaside resorts, and has a distinct urban feel. However, the beautiful sand and clear water make it a major spot for scuba diving in Vietnam. Check out the rice terraces – Outside of connections to the Vietnam War, the stereotypical image of Vietnam is of the many rice paddies. You can find these in the Muong Hoa valley.